"... despite its name, divided government is the only path for meaningful progress, especially given how “change” has ravaged this country at times. In the last 50 years, divided government has been relatively common. During the ‘50s, a combination of the Democratic Legislature and Republican executive resulted in an end to the Korean War, incredibly low rates of inflation and only minimal flare-ups in the Cold War. When united government resurfaced, it led to high inflation, expansive foreign policy disasters — Vietnam, of course — and a rebellious counterculture that derailed the legitimacy of the President Lyndon Johnson and cut the “Great Society” short. It took divided government, along with a secretive Nixon administration, to restore order and reduce a national crisis to a cultural hangover. It may not have looked pretty the way it happened — especially when the president and secretary of state aren’t exactly choirboys — but it did stop the bleeding before a second unified government under the Carter administration lost the plot again. The same sort of stability occurred during the Clinton presidency — low inflation, low unemployment, economic prosperity along with relative peace in terms of foreign policy. However, the pitfalls of unified government revealed themselves again during the six years of Republican control.. In that sense, a Republican president may not be the worst decision for America at this point. Sen. John McCain may now be pandering to the conservative base, but if he decides to once again take up the banner of Goldwater Republicans, he could provide a perfect complement to a visibly frustrated Democratic congress. Skepticism of Mr. Obama’s “post-partisan” politics is partially developed out of a sinister second meaning appropriated by bandwagon “agents of change” — pushing an agenda through a unified government with little to no opposition. 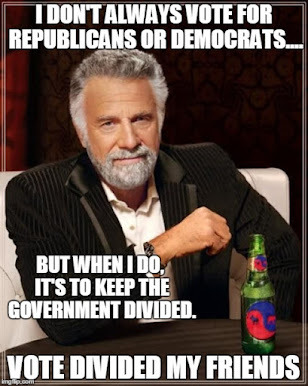 It’s not partisan because there is only one side. Yes, they could get a lot done. They could also do a lot of damage. " Jason has gone a long way to restoring my faith in the younger generation. There is hope. 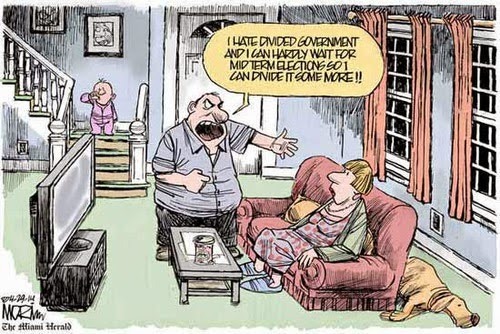 It is really not hard to understand why divided government works better. Use any mechanism the way it was designed to be used, it works better. A car is designed to run on roads, try to use it as a boat, and you don't get where you intended to go. We have a system of government built on the concept of checks, balances and separation of power. The constitution was designed with a specific architecture to ensure that (as James Madison said in the Federalist Papers) "Ambition must be made to counteract ambition." Divided Government reinforces the foundation of our Federal Government. It works the way it was designed to work by the founders - messy, slow, and contentious. Single party government bypasses and undermines the checks and balances, restrains oversight, invariably increases opportunity for corruption, bad decision making, with consistent disastrous results. Technorati tags: change, 2008 election, John McCain, Barack Obama, Hillary Clinton, Mitt Romney , Divided Government . Thanks for the link. However, my last name is Smathers. It's a common mistake.